PICKING A FLAT SCREEN TV! Picking a Flat Screen Television.....What's right for you? The Biggest question in Flat Screen Televisions has been Plasma or LCD, and now that they have added into the mix LED 3D and the latest 2 is Ultra and Curved TV……………it can be more and more confusing as to what is best for YOU! LED HDTV’s are new to the market, much more expensive, they are LCD’s answer to compete with plasma, the energy rating is extremely good, and if power consumption is your worry then LED is the Best option for you. However I will say that the difference in cost right now compared to the same level of Plasma…………….you will get a lot of years out of your plasma to make up the difference that you will save in your power bill. The Energy rating on a television, something that most retailers don’t point out to you “it is based on 10 hours a day for 365 days of the year” So when you compare it to your fridge something that is actually on the whole time the energy rating sticker states what is actually used…………..when it comes to your television it doesn’t reflect the average users power consumption. So understand how much you actually use your television if the energy rating is a factor in your decision. A few basics to keep things simple, LCD is a light based technology which means everything you see on the screen is made from light. Which in important terms your blacks are made up with light……….every colour has a shade of black in it. So we call that false black. Plasma’s are a pixel based technology which means they turn of the individual pixels and create what we call a true black. And that is why plasma can create a much clearer picture because it is truer than the light based technology. Now LED is LCD’s answer to improving their picture so they can compete with plasma. LED has two panels inside there is a LCD panel in front to take care of the colours, and the LED panel behind the LCD panel and its job is the blacks, so the picture can refresh faster and create a much better movie experience. That is also how LED can create such a high energy rating because it takes little to no power to run an LED light. In short LCD was originally designed for small computer screens. And they work great for that as the image doesn’t have to be blown up to a large size, but when you make a larger LCD screen the picture tends to be fuzzier or less clear. Ideally if you don’t choose LED over the LCD, (for cost reasons) screens smaller than 42 inches (107cm) LCD is perfect. There are two other reasons to choose an LCD screen. If you play allot of games on your television, like Xbox or PS3 and when I say allot I mean for hours a day, because LCD doesn’t have the image burn in risk that plasma’s do. And the other reason is it reflects less light than plasma so if you have allot of natural light in the room. Plasma’s have a glass panel on the front so it will reflect more……………but keep in mind ALL televisions reflect light and if you can close your curtains…………don’t make this an issue. Difference between Ultra HD and 4KTechnically, "Ultra High Definition" is actually a derivation of the 4K digital cinema standard. However while your local multiplex shows images in native 4096 x 2160 4K resolution, the new Ultra HD consumer format has a slightly lower resolution of 3840 X 2160. The lifetimes of all types of Televisions are around the same. The main difference is between brands not the actual LCD/LED/Plasma. You get what you pay for. If you see a $4000 dollar television and a $1500 television………you’re not buying a used car. The $4000 television is a better TV. When you watch a perfectly flat TV screen, the corners of the screen are further away than the center, so the eye sees a double trapezoidal (keystone) distortion of the screen rather than as a rectangle. But the image you actually see appears perfectly straight because the brain corrects for the keystone distortion—which is actually much larger than the pincushion distortion from a curved screen. So after watching for a period of time the brain will presumably compensate for the very subtle curve of the screen in the same way that it straightens out the trapezoidal screen. In other words, when faced with a less than ideal viewing angle the brain performs what is known as "perceptual adaptation" or more commonly, "getting used to it." It accounts for the differences in the incoming visual information versus what it normally would be and "adapts" that information to better fit with the mental model. So, for example, when you first get a new glasses prescription that's way more powerful than what you're wearing, everything appears heavily distorted at first. Eventually you get used to it and everything appears "normal." The same thing happens when you watch TV from an angle; at first it looks like a keystone, but after a while you get used to it. With a curved screen, that adjustment happens faster, because there's less too adjust for. You can always do your own research, But I say don’t let numbers confuse you 1,000,000 to 1 contrast ratio is a made up number by the individual manufacture, they will add in a word to describe the ratio to make it sound better but it would be their own form of measurement and not something to compare it too. Hertz is another thing you do not compare the number of Hertz in a Plasma to the Hertz used in LCD’s as they are used for completely different things they are not related. Hertz was increased and made an issue in LCD’s because watching blu ray was Unnatural. A problem that Plasma Never had…………so don’t compare them. Don’t base your decision on this picture is much brighter than the one over here so it’s better. Not so, this is a setting that can be changed with in the television. You can make all of them the same brightness. To define the difference you look at the finer details like how does the skin look, is it as clear as looking at the person beside you? Or is it washed. How dark are the darks? Turn it to a news program and watch the wording go across the screen this will tell you how quickly the screen will refresh………or handle fast movement clearly. This is what’s important when picking a good Flat Screen TV. If you enjoy your movie experience……………..Unfortunately the great picture is only half the experience and when purchasing a new television it is the best time to update your surround sound system because this is when you get better discounts, it really does mean the more you buy……….the more money you save. If all else fails and you still have problems write me an email, I do offer advice it’s free. If you are not in my area of service and I can’t come to your home for a free consult, I do know many qualified technicians that offer this service as well throughout the country and I am more than happy to get them to come to you as well. 3D TV….Can I watch 2D video on a 3D TV? Yes. You can watch your 2D TV and enjoy it just the same as you would have any other program. It gives you the option of going 3D and my advices is save a little bit more and buy 3D because the 3D is a fantastic option. Can you watch 3D TV without glasses? They are working on that yes, but they are not ready to be stream lined. So you will need to wear them if you want to enjoy the 3D affect. Unlike movie theatres, they use polarized glasses. 3D TV’s have an active-shutter LCD glasses. What this means is that there is a small transmitter inside the glasses that is communicating with the TV to block your left eye when an image for the right eye is on the screen, and vice versa. And they do this 120 times per second. And because of this it requires electronics and a small battery. So they are not the paper thin ones from the movies. It is advised that if you have epilepsy or are under the age of six that it is not recommended for viewing in 3D, the 2D will be fine. But you can take that under consideration before you hand out your glasses. What can I watch in 3D?……….well at this stage there isn’t a lot of options in movies yet………..Most new releases will be 3D from now on! ESPN will be launching a 3D television in the near future I don’t know when it will be available in Australia, these are all things happening in the states. But I will say they will do it this year. Some TV’s such as Toshiba’s ZX900 Cell TV and Samsung’s LED9000 will actually be able to generate 3D content from 2D content………..so all your none 3D blu Ray’s or HD DVD’s. But it clearly won’t look as good as the proper 3D format. Will I need to change my Blu Ray player? Yes you will need to update your Blu ray player, and most likely you will have to update your HDMI lead as well. Unless you have already have the “1.4” rated HDMI. The only Blu Ray player that will be capable for the software update would be the PS3, but they haven’t as yet released it. They do have 3D receivers and it would make life easier if you updated that as well, but it’s not necessary there are ways around getting the best sound from you knew system without this. So if you just paid $4000 dollars on your new amp……….don’t worry not a problem. But if you are buying new………..take this under consideration you will be better to get it with everything else. High Definition Media Input 1.4 allows you to send full 1080p 3D content to run everything through each other you will need to have everything rated at 1.4. The cable sends 1080p it also has Ethernet information that it can send an as well it can send Digital audio both directions. This means only two cables for your television the HDMI and the antenna lead. And it is of the best possible quality. They are both sending the same information; the difference is how they are sending it. In 1080i each frame of video are sent in alternative fields. The fields are composed in 540 rows of pixels or lines running from top to bottom of the screen. To make up the 1080 rule every second line is doubled. In 1080p each frame of video is sent out progressively. This means that none of the lines are doubled and it makes up a full frame picture. And the result is a much smoother and clearer image. In short even though you see 1080 in both so you can opt for the cheaper option………..there is a big difference between them. Progressive is better. In 3D how big should I get my TV? 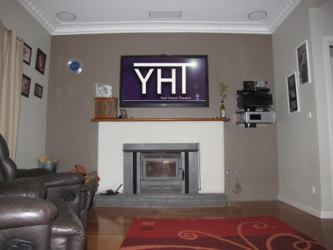 Well unlike the other types of flat screens where we judge distance and size of the room to base your decision. In 3D it breaks those rules. Bigger is better. It is designed to create a more lifelike affect. And because of that make sure you don’t buy anything smaller than 42 inches because you will not get anything out of your purchase otherwise.